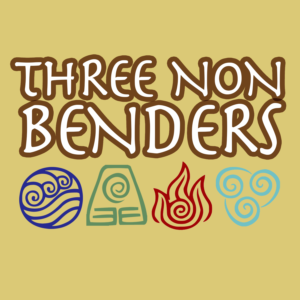 Three Non Benders could easily be renamed “Three Total Nerds,” since that’s basically what we are. Hailing from backgrounds in literature, film, and TV, we came together to discuss the show analytically and a little bit fan-girly. We wanted to make a podcast about Avatar because it contains serious themes that transcend it’s context in history and as a kids show. We want to honor the hard work the creators put into the show by taking it seriously as a piece of art, and treating it with the respect and admiration it deserves. Each episode of the podcast will cover one episode of the show, unless said episode is in two parts. We will analyze the story arcs, animation techniques, directing and writing choices, and other technical aspects–and of course we will talk about our favorite characters, our favorite ships, our favorite villains, and other general favorites that we have throughout the series. We’ll try to get as deep as we can into historical references and contexts. Any feedback is much appreciated! You can find other information or contact us by visiting our Team page.